The Grizzly and Wolf Discovery Center is home to four captive gray wolves. 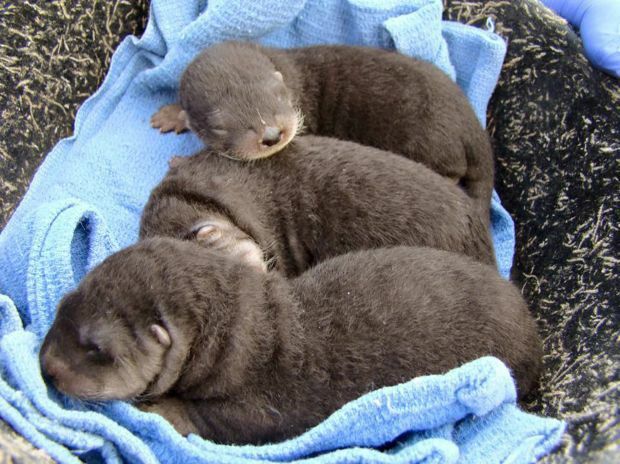 Three baby river otters — two boys and a girl — were born at ZooMontana on March 11, 2018. This architect's rendering shows the newly constructed Grizzly and Wolf Discovery Center's "Banks of the Yellowstone: A riparian habitat" building. Inside the building will be two aquariums, one for river otters and the other housing cutthroat trout and arctic grayling. The facility will also have a running stream for children to play in. Two otters born at ZooMontana last year will be on loan to the Grizzly and Wolf Discovery Center in West Yellowstone for a new riparian exhibit. “Banks of the Yellowstone: A riparian habitat” will be housed in a 22,000-square-foot building. The facility will include an aquarium for five otters, a separate aquarium for Yellowstone cutthroat trout and arctic grayling, an indoor children’s play stream, and an aquarium with native reptiles and amphibians. That discussion will include the downfall of the Yellowstone Lake cutthroat trout population following the illegal introduction of lake trout in the early 1990s. Wolves living in an adjoining portion of the center will have a window into the aquariums, emphasizing the interrelatedness of the species, Heine said. The center is already home to four gray wolves, seven grizzly bears, a colony of ground squirrels and a wide assortment of raptors including three bald eagles, a golden eagle, and two great-horned owls. The new facility cost $8 million to build and is set to open in late spring or early summer. A “state of the art” filtration system will allow the aquariums to recycle water so there’s no strain on the community of West Yellowstone’s limited water system. The M.J. Murdock Charitable Trust pitched in $250,000 for the project. Murdock co-founded Tektronix in Portland, Oregon, just after World War II. The company manufactures equipment for testing and measurement, like oscilloscopes. Heine said the new building, located to the southwest of the existing facilities, which are all spread across 14 acres, has been on the drawing board for 15 years. Funded by a loan, grants and individual donations, the center broke ground three years ago. The center is in a prime location for visitors seeking to learn more about the Yellowstone ecosystem. It’s close to the West Entrance of Yellowstone National Park, which has averaged more than 4 million visitors the past four years with about 600,000 vehicles passing by mostly in the summer. The center opened in 1993 and went nonprofit in 1999. Visitation to the bears, wolves and birds has gone up from about 70,000 in the early years to about 160,000 now, Heine said. Those visitors and the animals are cared for by a year-round staff of 26, which balloons to about 40 in the summer. Yellowstone Park naturalists also interact with the center, providing programs in the facility’s outdoor amphitheater during the summer. The Grizzly and Wolf Discovery Center took delivery of the two otters — Francis and Wade — from ZooMontana last month. The two are part of the zoo’s fab four litter born almost a year ago that were abandoned by their mother. Zookeepers found the pups and raised them by hand. One pup, Frodo, died from kidney issues. “I couldn’t think of a better place for them to go,” said Jeff Ewelt, executive director of ZooMontana. Having them close by will allow zookeepers, who helped raise the pups and developed a bit of an emotional attachment, to go visit them. Plus, the facility where they will live is brand new. The Grizzly and Wolf Discovery Center is open year-round. Summer hours, from May through Labor Day, are 8:30 a.m. to 8:30 p.m. Admission costs $13 for adults, $8 for children 5 to 12, and is likely to go up by $2 when the new riparian display opens. Admission is good for two days. More information can be found online at grizzlydiscoveryctr.org.